Home Chromoblastomycosis. A forgotten mycosis. Chromoblastomycosis is one of the Neglected Tropical Diseases. It is classified as a subcutaneous mycosis alongside sporotrichosis and mycetoma. Endemic in tropical low-income populations, this disease represents an unattended public health problem due to the economic burden on both the patient and the health services. In the last decades research into this disease has increased. Despite this, clinical information is rather limited, negatively impacting on patients’ prognoses. The objective of this review is to provide a summary of the disease for medical students and healthcare professionals. The prevalence of chromoblastomycosis changes with geographical region, with its highest peak found in tropical locations such as South-Africa, Latin America, and Southern Asia. However, cases have been reported in Europe, North America and Australia . Since reporting of chromoblastomycosis is not compulsory, epidemiology is based on medical literature. Its incidence ranges from 1:6,800 (14/100,000) in Madagascar to 1:8,625,000 (0.012/100,000) in the USA . The number of cases rises among low-income populations who live in the countryside since this mycosis is strictly related to agriculture . This disease is caused by pathogenic filamentous fungi, part of the called so-called “black yeast” family . Currently, there have been described at least 10 pathogenic species, Fonsecaea pedrosoi, Fonsecaea monophora, Fonsecaea nubica, Fonsecaea pugnacious, Cladophialophora carrionii, Cladophial-ophora bantiana, Phialophora verrucosa, Rhinocladiella aquaspersa and Exophiala dermatitidis . The two main pathogens are F. pedrosoi, often associated with humid climates, and C. carrionii, the prevalence of which increases in semi-arid areas . Figure 1: The melanin in the cell wall provides defences against the host immune response. The mechanism of infection for chromoblastomycosis is traumatic inoculation; once this has occurred, it starts to replicate resulting in muriform cells . Humoral immunity plays a crucial role in the host’s immunological response. Dendritic cells are the first line of defense, followed by neutrophils, macrophages, CD4 and CD8 lymphocytes . Virulence attributes expressed by the fungi include thermotolerance, which allows it to grow at 37 ºC. Also, the fungal cell wall plays a relevant role in the host response . 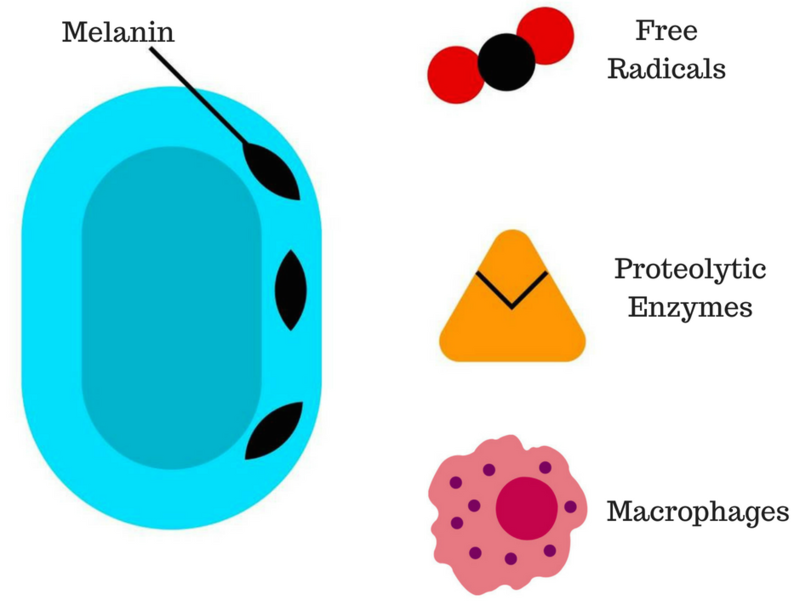 The melanin inclusions provide protection against macrophages, free radicals, such as nitric oxide and proteolytic enzymes  (Figure 1). However, the mechanisms of host defence and the interaction of these with the pathogen are not yet fully understood . Due to the mechanism of infection, limbs, hands, and feet are the most common area of presentation. Clinical symptoms of chromoblastomycosis vary depending on the stage, starting as a macular skin lesion at the inoculation point, and progressing into tumoral or verrucous-type injuries. Occasionally, it can also present as a plaque or cicatricial-like lesion . Common complications include bacterial co-infection, lymphoedema, and chronic ulcers; malignant transformation to squamous cell carcinoma or melanoma has also been reported . Differential diagnosis in advanced stages includes infectious pathologies such as cutaneous tuberculosis, leishmaniasis, and sporotrichosis, as well as non-infectious like verrucous carcinoma  (Figure 2). Figure 2: Chromoblastomycosis plaque lesion on the left buttock. Since there are no pathognomonic signs or symptoms, diagnosis requires a set of laboratory investigations. In the first instance, biopsy of the affected area is required, looking for clustered muriform cells  (Figure 3). Microbiological culture must be used to determine the aetiological agent. Sabouraud-agar (SGA) is recommended; however, due to the nature of the fungus, culture can take at least a week to yeild results . PCR is also recommended in order to provide molecular differentiation if the culture or microscopy was not conclusive . Figure 3:Granular reaction with giant cells ingesting a muriform cell (H&E). Treatment varies within the stage of the disease. In early stages, surgery is recommended; options include standard surgery, local heat therapy, and cryo-surgery, with this last option reporting the best results when followed by systemic antifungals . However, surgery is contraindicated in mild-severe forms due to the risk of lymphatic spread of the disease. Chemotherapy against chromoblastomycosis uses three main systemic antifungals: itraconazole, 5-fluticasone and terbinafine . This said, the lack of proper guidelines and the increase in resistance to therapeutic agents have lead clinicians to provide empirical substances such as Amphotericin B, which can result in increased side effects and complications of treatment. Clinical management recommendations from the literature can be found in Table 1. Prevention of the disease is focused on improving the living conditions for agricultural areas in countries with higher prevalence . 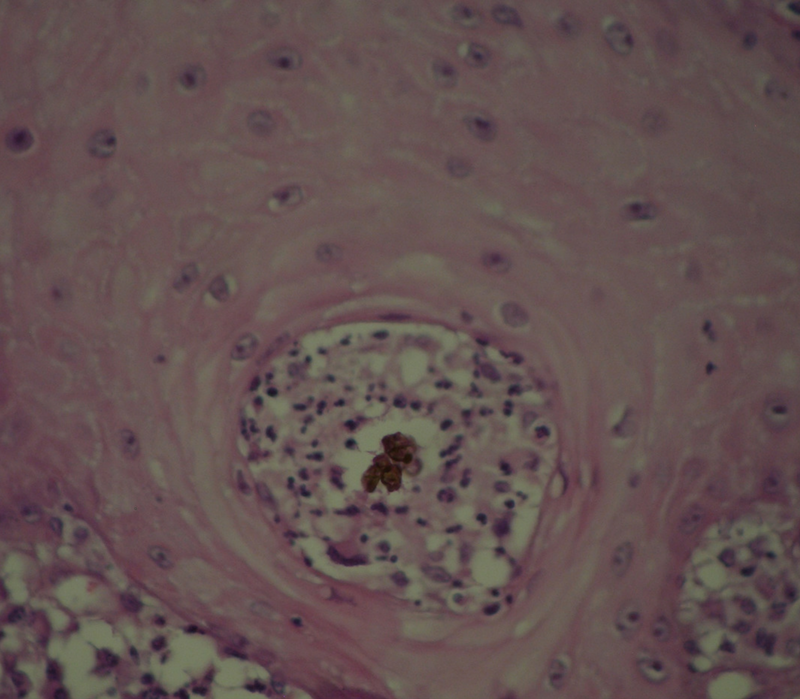 Fortunately, chromoblastomycosisis is rarely fatal, though loss of function or amputation of the affected limb is common , affecting the patient’s quality of life and the income of their families. In resource poor rural environments, this can be a cause of extreme poverty. The cost of the disease is expected to represent an important burden for the healthcare system. Nevertheless, thus far, there have been no public health studies examining this. Additionally, lack of research and health policies toward chromoblastomycosis have become a relevant issue in clinical practice. Compared to other Neglected Tropical Diseases (NTDs) such as Dengue, Chikungunya, Chagas or Rabies, no government has established a national health plan to deal with this problem. The few available clinical guidelines lack information and, as other authors have stated, no long-term clinical trials have been completed . The small amount of information about this mycosis increases the misdiagnoses in primary healthcare complicating further treatment and substantially reducing the chances of success. Chromoblastomycosis is a topic rarely studied in universities and colleges worldwide; even in those countries with a high prevalence rate. However, a wide range of review articles and treatment actualizations are frequently published in mycological journals. As medical students, we have the opportunity to change the paradigm, ending the ignorance and enhancing further investigations in this field. Queiroz-Telles, F., De Hoong, S., C.L. Santos, D. W.,Guedes Salgado, C., Aparecida Vicente, V., Bonifaz, A., … Walsh, T. (2017). Chromoblastomycosis. Clinical Microbiological Reviews, 30(1), 233–276. Al-Doory Y. 1983. Chromomycosis, p 95–121. In Di Salvo AF (ed), Occupational mycoses. Lea & Febiger, Philadelphia, PA.
 Urán, M. E., & Cano, L. E. (2008). Melanina: implicaciones en la patogénesis de algunas enfermedades y su capacidad de evadir la respuesta inmune del hospedero. Infectio, 12(2), 128–148. Rojas OC, González GM, Moreno-Treviño M, Salas-Alanis J. Chromoblastomycosis by Cladophialophora carrionii Associated with Squamous Cell Carcinoma and Review of Published Reports. Mycopathologia. 2015;179(1–2):153–7. Ameen M. Chromoblastomycosis: Clinical presentation and management. Clin Exp Dermatol. 2009;34(8):849–54.